The Assistant Stage Manager assists the production stage manager in fulfilling the various responsibilities. 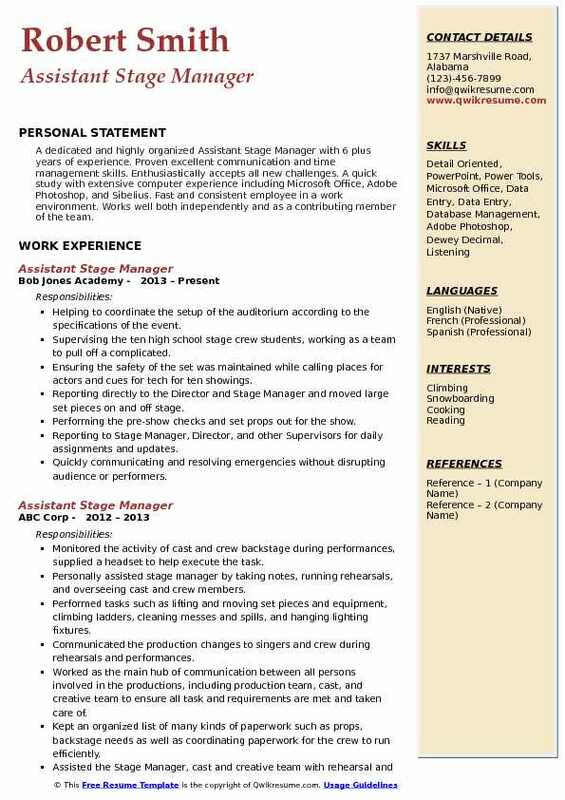 The duties incorporated in the Assistant Stage Manager Resume includes the following – attending production meetings, handling clerical tasks, running rehearsals, ensuring smooth workflow during performances, ensuring stage and rehearsal space, notate blocking, training the running crew, be available at all times for the stage manager to contact, arranging set pieces and props and taking over all responsibilities that are assigned by the stage manager. 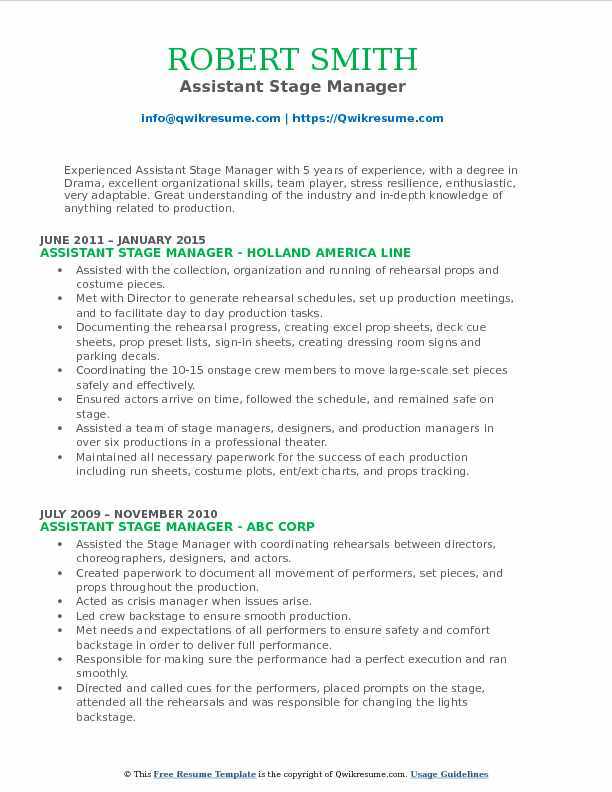 Those interested in the assistant stage manager position should highlight in the assistant stage manager resume skills such as – fast thinking, production stage expertise, abilities to work under pressure, physical strength and public speaking skills. Candidates should have experience of performance management and be proficient in MS Office and other related software. 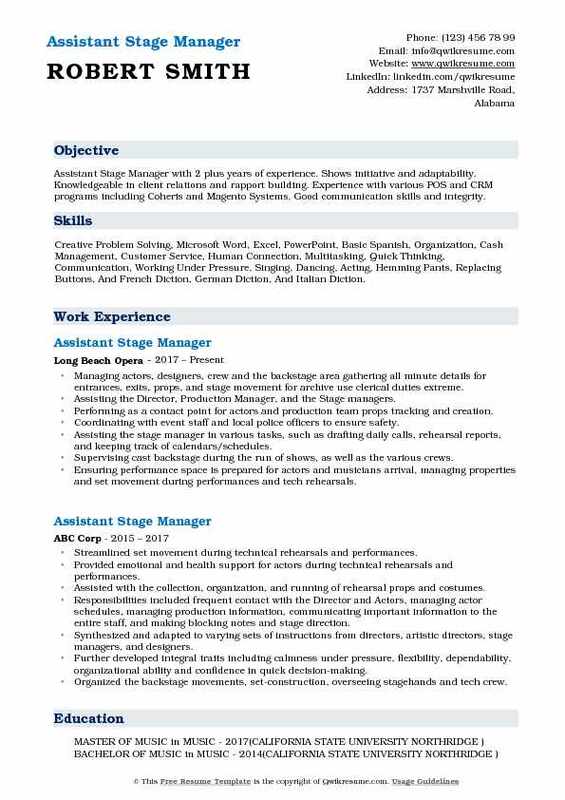 Eligible candidates applying for this job role should embrace a stage management experience in addition to theatre studies. Headline : Assistant Stage Manager with 5 plus years of experience. Strong skills in time management, prioritizing tasks and meeting deadlines. Works well under pressure in fast-paced work environments. Organized and detail-orientated. Strong communication skills and a very professional demeanor. Working with the Director and the heads of all other departments, during rehearsal and after opening. Scheduling the rehearsal and outside calls in accordance with equity regulations. Assuming active responsibility for the form and discipline of rehearsal and performance. Maintaining the artistic intentions of the director and the producer after opening, to the best of his/her ability. Including calling correctional rehearsals of the company when necessary and preparation of the understudies. Maintaining discipline as provided in the equity constitution, by-laws, and rules where required, appealable in every case to equity. Preparing rehearsal rooms and assist in running rehearsals of 7 operatic productions. Summary : Assistant Stage Manager with 9 plus years of experience is seeking a position in stage or production management. My objective is to assist in the efficient running of daily operations of theatre, opera, and other arts organizations and venues. Overseeing and ensuring the safety and healthy working environment of large casts of artists and musicians. Creating, maintaining, and distributing the running paperwork to technical crews. Working with La Opera to coordinate schedules, site plans, and all elements of production. Communicating with and coordinating the equipment rentals, food vendors, and security and parking staff. Facilitating all backstage movements, including pieces, actors, and technicians. Continuing to maintain a positive team environment. Working alongside the stage manager during rehearsals and performances to document and execute repeatable show conditions. Updating and distributing paperwork, communicating between the cast and stage manager, executing backstage tasks during performances, and keeping track of all show props. 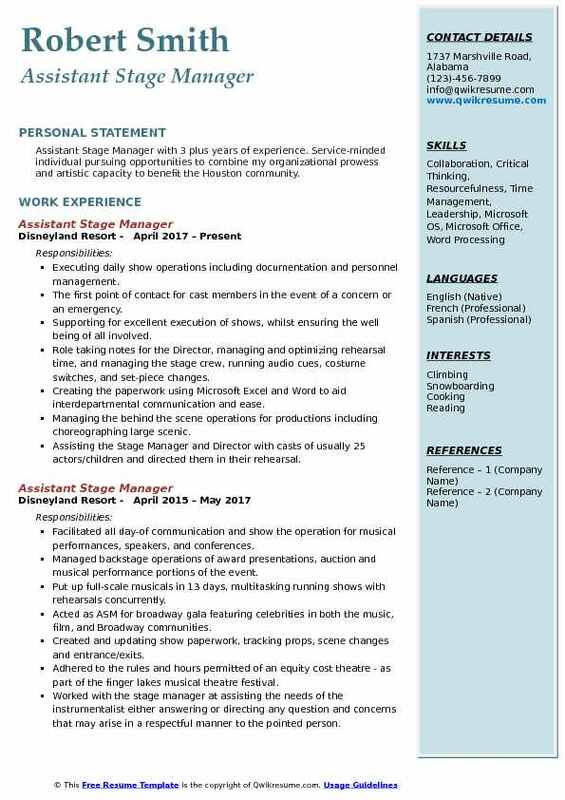 Summary : Assistant Stage Manager with 11 plus years of experience is seeking to obtain a position where I can utilize my skills and hardworking ability, to benefit my employer and be of service to others. Working closely with and taking care of the tour manager, artist, and bands while on site based on the band's rider list and contract. Coordinating with event security the needs of the artist and backstage. Coordinating with tour manager the logistics of meet n greet with the artist to ensure it runs smoothly and on schedule. Making sure correct amount of passes are at will call for any guest of the artist. Organizing daily rehearsal and performance schedules alongside the stage manager. Forecasting and planning for potential issues involving the performance of the production and the creation of the set. Documenting blocking, props, light and sound cues for actors, directors, costume and set designers. Presenting during all rehearsal periods to ensure quality communication of artistic vision and logistical crews. 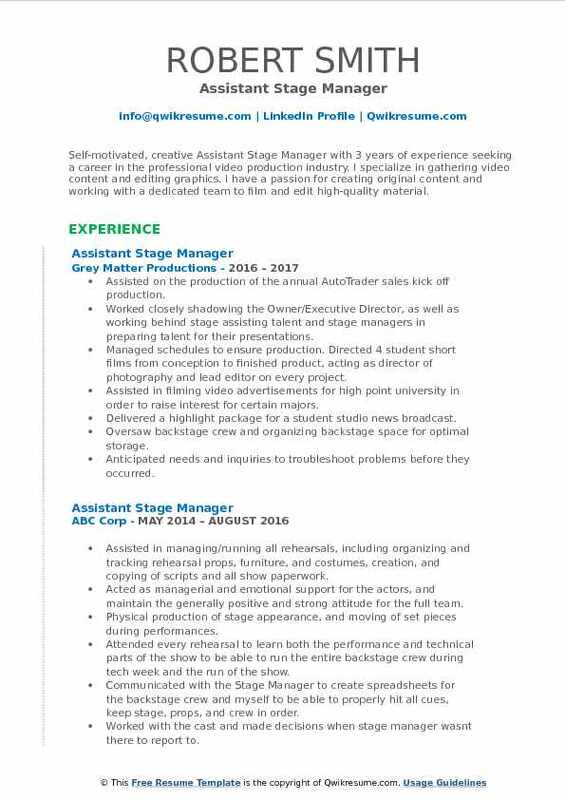 Objective : Self-motivated, creative Assistant Stage Manager with 3 years of experience seeking a career in the professional video production industry. I specialize in gathering video content and editing graphics. I have a passion for creating original content and working with a dedicated team to film and edit high-quality material. Skills : Adobe Premiere, After Effects And Photoshop, Advanced Proficiency With Windows And Macintosh OS, Excellent Writing, Effective Communicator. Assisted on the production of the annual AutoTrader sales kick off production. Worked closely shadowing the Owner/Executive Director, as well as working behind stage assisting talent and stage managers in preparing talent for their presentations. Managed schedules to ensure production. Directed 4 student short films from conception to finished product, acting as director of photography and lead editor on every project. Assisted in filming video advertisements for high point university in order to raise interest for certain majors. Delivered a highlight package for a student studio news broadcast. Oversaw backstage crew and organizing backstage space for optimal storage. Anticipated needs and inquiries to troubleshoot problems before they occurred. Created run sheets, prop checklists, cue calls and actor/prop placement during rehearsal periods and performances. 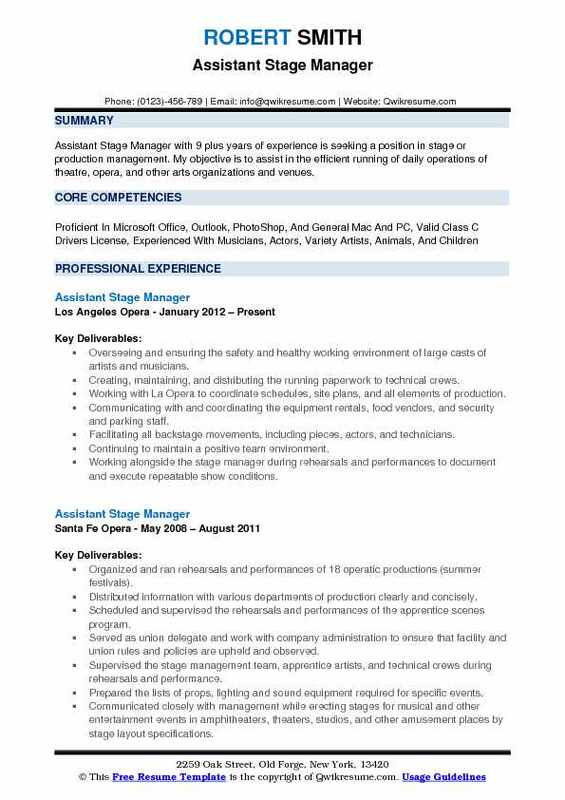 Objective : Assistant Stage Manager with 3 plus years of experience. Service-minded individual pursuing opportunities to combine my organizational prowess and artistic capacity to benefit the Houston community. Executing daily show operations including documentation and personnel management. The first point of contact for cast members in the event of a concern or an emergency. Supporting for excellent execution of shows, whilst ensuring the well being of all involved. Role taking notes for the Director, managing and optimizing rehearsal time, and managing the stage crew, running audio cues, costume switches, and set-piece changes. Creating the paperwork using Microsoft Excel and Word to aid interdepartmental communication and ease. Managing the behind the scene operations for productions including choreographing large scenic. Assisting the Stage Manager and Director with casts of usually 25 actors/children and directed them in their rehearsal. Organizing the back-stage scene changes, prop hand-offs, and quick costume changes. 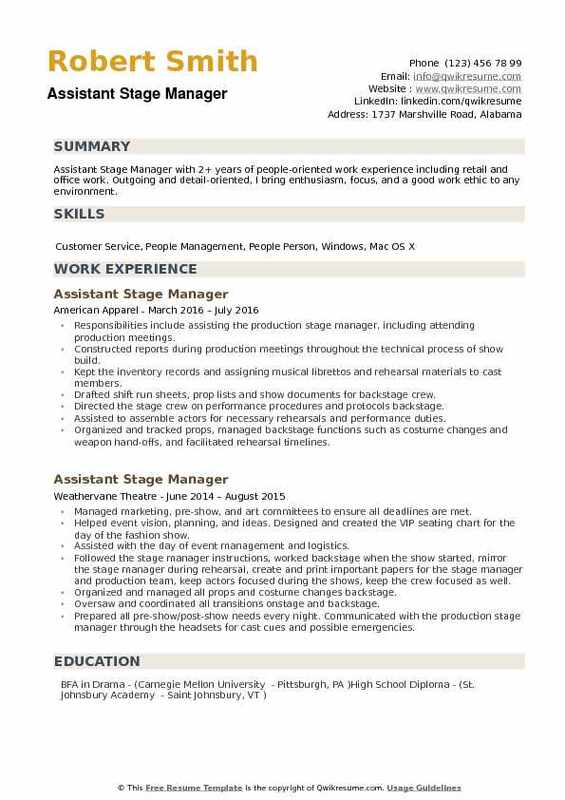 Objective : Assistant Stage Manager with 2 plus years of experience. Shows initiative and adaptability. Knowledgeable in client relations and rapport building. Experience with various POS and CRM programs including Coheris and Magento Systems. Good communication skills and integrity. 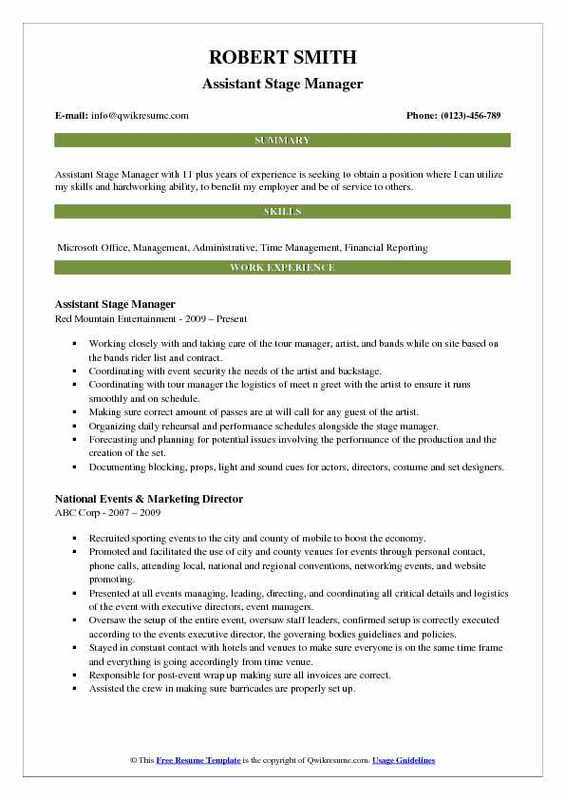 Skills : Creative Problem Solving, Microsoft Word, Excel, PowerPoint, Basic Spanish, Organization, Cash Management, Customer Service, Human Connection, Multitasking, Quick Thinking, Communication, Working Under Pressure, Singing, Dancing, Acting, Hemming Pants, Replacing Buttons, And French Diction, German Diction, And Italian Diction. Managing actors, designers, crew and the backstage area gathering all minute details for entrances, exits, props, and stage movement for archive use clerical duties extreme. Assisting the Director, Production Manager, and the Stage managers. Performing as a contact point for actors and production team props tracking and creation. Coordinating with event staff and local police officers to ensure safety. Assisting the stage manager in various tasks, such as drafting daily calls, rehearsal reports, and keeping track of calendars/schedules. Supervising cast backstage during the run of shows, as well as the various crews. Ensuring performance space is prepared for actors and musicians arrival, managing properties and set movement during performances and tech rehearsals. Repairing props as needed, managing actor entrances and exits from stage and performance space. Communicating between actors and stage manager during technical rehearsals, maintaining safety practices backstage. 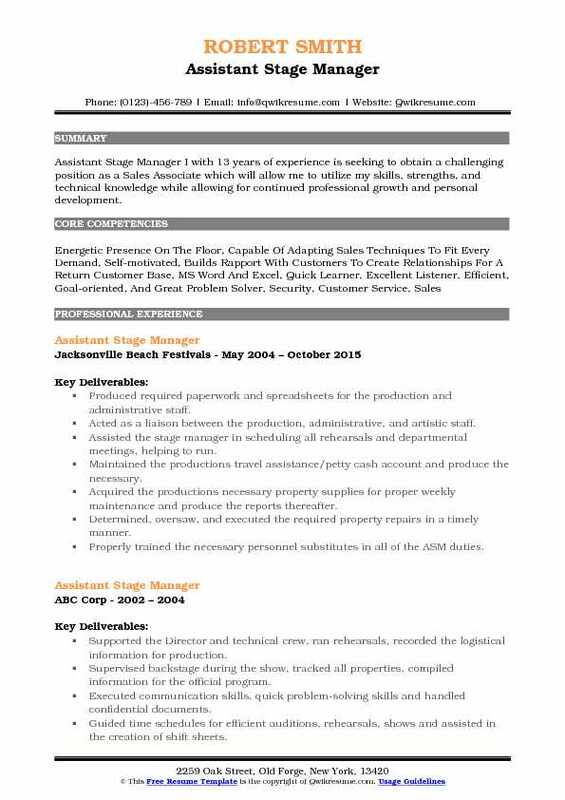 Headline : Experienced Assistant Stage Manager with 5 years of experience, with a degree in Drama, excellent organizational skills, team player, stress resilience, enthusiastic, very adaptable. Great understanding of the industry and in-depth knowledge of anything related to production. Assisted with the collection, organization and running of rehearsal props and costume pieces. Met with Director to generate rehearsal schedules, set up production meetings, and to facilitate day to day production tasks. Documenting the rehearsal progress, creating excel prop sheets, deck cue sheets, prop preset lists, sign-in sheets, creating dressing room signs and parking decals. Coordinating the 10-15 onstage crew members to move large-scale set pieces safely and effectively. Ensured actors arrive on time, followed the schedule, and remained safe on stage. Assisted a team of stage managers, designers, and production managers in over six productions in a professional theater. Maintained all necessary paperwork for the success of each production including run sheets, costume plots, ent/ext charts, and props tracking. Summary : Assistant Stage Manager I with 13 years of experience is seeking to obtain a challenging position as a Sales Associate which will allow me to utilize my skills, strengths, and technical knowledge while allowing for continued professional growth and personal development. Produced required paperwork and spreadsheets for the production and administrative staff. Acted as a liaison between the production, administrative, and artistic staff. Assisted the stage manager in scheduling all rehearsals and departmental meetings, helping to run. Maintained the productions travel assistance/petty cash account and produce the necessary. Acquired the productions necessary property supplies for proper weekly maintenance and produce the reports thereafter. Determined, oversaw, and executed the required property repairs in a timely manner. Properly trained the necessary personnel substitutes in all of the ASM duties. Maintained paperwork up to date for members of the stage management team. Directed 180 dancers and crew teams through effective and efficient tech-time rehearsals and shows. Headline : A dedicated and highly organized Assistant Stage Manager with 6 plus years of experience. Proven excellent communication and time management skills. Enthusiastically accepts all new challenges. A quick study with extensive computer experience including Microsoft Office, Adobe Photoshop, and Sibelius. Fast and consistent employee in a work environment. Works well both independently and as a contributing member of the team. Helping to coordinate the setup of the auditorium according to the specifications of the event. Supervising the ten high school stage crew students, working as a team to pull off a complicated. Ensuring the safety of the set was maintained while calling places for actors and cues for tech for ten showings. Reporting directly to the Director and Stage Manager and moved large set pieces on and off stage. Performing the pre-show checks and set props out for the show. Reporting to Stage Manager, Director, and other Supervisors for daily assignments and updates. Quickly communicating and resolving emergencies without disrupting audience or performers. Performing any and all tasks applicable to stage manager in times of his absence. Creating the paperwork portraying where the props were set on and off stage, also which actors entered with props. Supervised the placement of props on and off stage and guaranteed props were set on and off stage before performances. Supporting the Stage Manager as a technical production liaison. 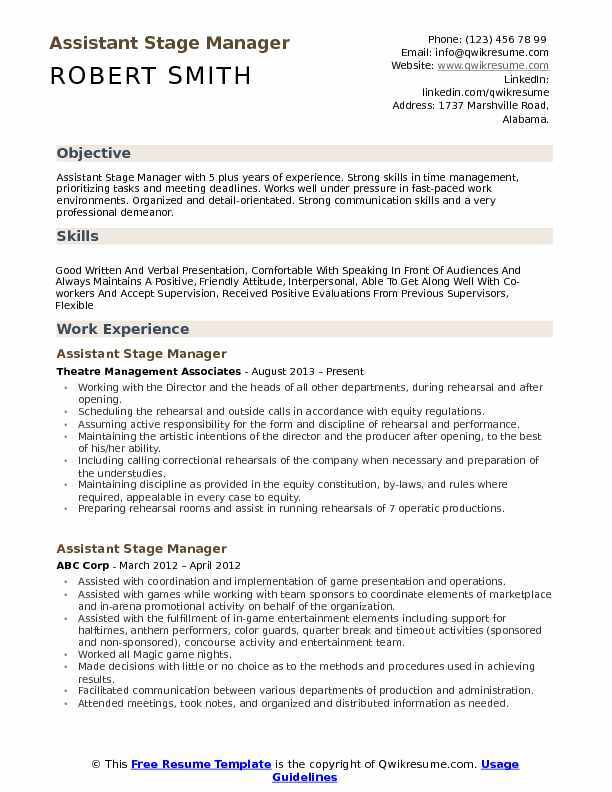 Objective : Assistant Stage Manager with 2+ years of people-oriented work experience including retail and office work. Outgoing and detail-oriented, I bring enthusiasm, focus, and a good work ethic to any environment. Responsibilities include assisting the production stage manager, including attending production meetings. Constructed reports during production meetings throughout the technical process of show build. Kept the inventory records and assigning musical librettos and rehearsal materials to cast members. Drafted shift run sheets, prop lists and show documents for backstage crew. Directed the stage crew on performance procedures and protocols backstage. Assisted to assemble actors for necessary rehearsals and performance duties. Organized and tracked props, managed backstage functions such as costume changes and weapon hand-offs, and facilitated rehearsal timelines. Coordinated and organized the actors and crew. Served as a board member, assisted with ticket sales, promotional materials, and planning for future society growth.